Georgia Company Incorporates Insertion Flow Meters into Additive Blending. Hoffer Flow Controls supplies insertion liquid turbine flowmeters and signal conditioners to an equipment company located in Atlanta, GA on an OEM basis. This company produces blending and additive metering equipment for the petroleum and chemical industries. Through the use of their advanced electronic systems, they provide injection metering systems that provide precise in-line additive blending. They are recognized throughout the world as a leader in additive injection blending systems. 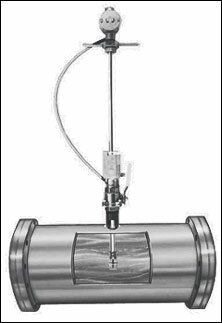 The typical liquid insertion flowmeter supplied by Hoffer Flow Controls for this precise application is an adjustable type which allows the user to install or retract the flowmeter without shutting down the line. The adjustable Hoffer insertion flowmeter is installed directly on an isolation valve to facilitate the removal of the flowmeter. The Hoffer insertion turbine flowmeter incorporates a number of design features that are important for this application. All Hoffer flowmeter components are precision machined including the hydro-dynamically balanced rotor assembly. The lightweight rotor allows for extremely rapid flowmeter response to changes in flow conditions. Many other insertion turbine flowmeters incorporate cast rotor assemblies which are not as responsive as the Hoffer machined rotor assembly. The Hoffer insertion flowmeter series is available with a number of flowmeter bearing options. The bearings are selected based upon compatibility with the process liquid and service conditions that the flowmeter will be exposed to. In this particular application, the insertion turbine flowmeters are supplied with shielded, self lubricating ball bearings. This type of bearing design incorporates a ball bearing that is shielded on both sides. Additionally, a moly-disulfide lubricating agent is impregnated into the race of the bearings. There are several benefits of this bearing design versus an open race ball bearing flowmeter. First, if fine particulate is present in the process the shielded ball bearings would not be as susceptible to fouling as the open race ball bearings would be. Secondly, the shielded, self-lubricating ball bearings do not rely on the flowing fluid to lubricate the bearing race. Open race, non-lubricating bearings would require lubrication from the flowing fluid and would not tolerate air spinning. Open race,non-lubricating ball bearings would fail if exposed to air spinning for any period of time. Minimal amount of maintenance is a key issue in the decision making process for this company. The Hoffer insertion turbine flowmeter product line meets this need. This Georgia based company supplies their high quality blending and additive metering equipment throughout the world. Product quality is a major consideration in their decision making process. Hoffer Flow Controls has a reputation for providing a high quality product and has had an ISO 9000 quality system in place since the late 1990’s.